Folgate Insurance Company has been recognised as a trusted and established insurer in the UK back from when it was formed in 1877. This prompted us to tell you a little more about our history. In January this year we transformed our business, re-branding Folgate as the company that unites traditional values, with innovative underwriting. Shortly after this re-brand, we discovered a piece of our history – this limited-edition Dennis box Truck which features the original Folgate branding. This collectable toy was manufactured by a company called Lledo which produced die-cast vehicles in Enfield, England from 1983 to 1999. 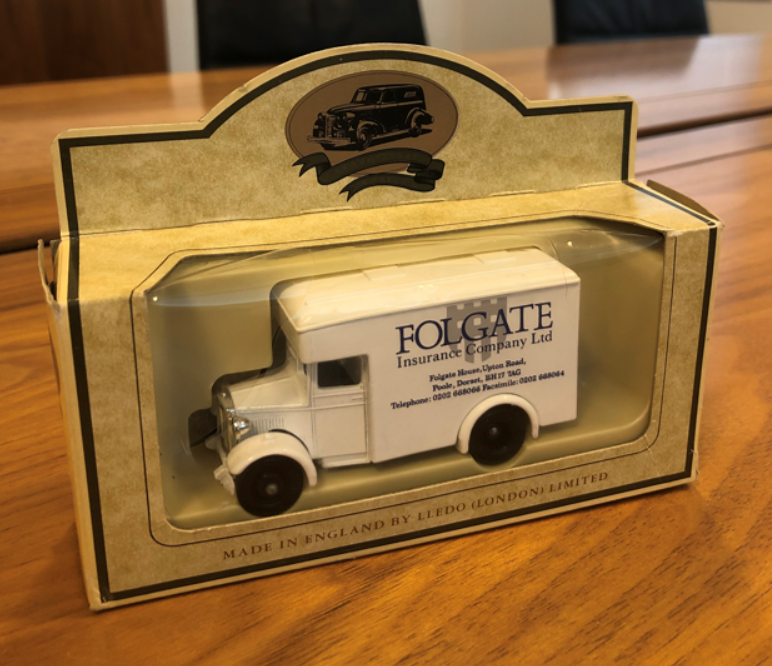 The Folgate Truck was made for promotional purposes in the 1980’s. During this time, Folgate principally wrote major personal lines and commercial lines accounts, as well as generating business by regional brokers. Folgate was placed into run-off in 2002, however, APC could see the potential of resurrecting this long-established brand and in September 2015 we were granted our licence by regulators to act as a re-insurer. As our managing agent, APC was then in a position to commence writing commercial lines business through our business. In June 2018, we were granted a direct licence by the Prudential Regulation Authority and now act as the direct insurer. Folgate Insurance Company Ltd underwrites binding authorities through MGA’s and independent brokers and offers over 20 commercial insurance products on-line. The Folgate Lledo Denis Box truck will be kept safely at our head office in the insurance district of the City of London to remind us of our traditional values.